Ede-Aroh festival is an annual festival held at the Afor market square every last Afor market day of the year in which cocoyam is celebrated. To every Abagana person, if sowing and harvesting of yam is the reserve of men, then sowing and harvesting of coco-yam is exclusive to women; balancing the activities of sowing and reaping between the sexes. During Ede-Aroh festival, women bring portions of their cocoyam yield to Aroh deity in gratitude of Aroh’s protection and guide. The cocoyams are prepared and eaten as bond of brotherhood among the people. In preparing for Ede-Aroh, the Aroh priest is engage in a series of activities designed to make the occasion successful. He sacrifices to the Aroh deity and solicits its protection over the people throughout the duration of the festival. He also implores the gods to grant him the will and health to perform his duties creditably. The masquerades that are organized by the elders visits the Aroh (priest) a night before to find out if Aroh deity has granted his permission so that the festival could be celebrated. they also give thanks on behalf of the womenfolk and the children of the town to the deity for his protection in the previous years and seen assurance that protection in the previous years and seen assurance that he would continue to do until the next festival. Most of the dangerous masquerade appear in the night in order to perform at the Aroh square between 12 mid night and 3am. Some perform in the day time at the same Aroh square while other worship at the Aroh shrine. During this period, the council of elders is summoned by the priest to the Aroh shrine to ascertain the most appropriate date which should be announce to the public for the ceremony. This is done through divination “igba-afa”. It is the responsibility of the diviner to foresee all the ills that might be fall anyone or all and ensure all the necessary ritual are performed for the success of the festival after ascertaining the appropriate date which must fall on an oye market day, this is announced to the public. Ede-Aroh is a two-day festival in Abagana. For the youths particularly males, Ede Aroh is a period to show manly strength and display their ability to absorb pain and yet overcome struggles of life. The 9 villages that make-up Abagana come out with masquerades who compete against each other in a well-organized cane-flogging contest for two days. On the first day of the Ede-Aroh, the competition takes place at the popular Omenka (A.k.a Badunka) Square. While, the second day of the contest which is usually bigger is hosted at Aroh Square. The cane-flogging contests typically commence by 12noon, and the winning masquerade(s) go home with diverse gifts ranging from cash to cows or rams. Meanwhile, youths from the 9 villages who may not be wearing masquerade costumes also compete amongst themselves. 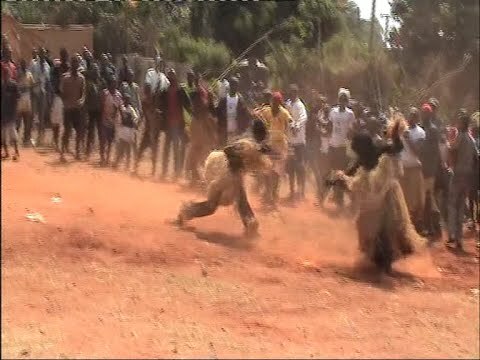 On the evening of the second day of Ede Aroh festival, the entire community is shutdown as both the old and young troop to Aroh Square to witness a razzmatazz of masquerades and other Igbo cultural nuances.